Back to school is almost here! We just got an email that we still can't access our classrooms... I'm starting to freak out a little! I need to get up there and assess the situation... I think I left in a nightmarish state. But I'm working on being positive - so today, I did a little back to school shopping and I'm enjoying my last few days of calm before school mode takes over. 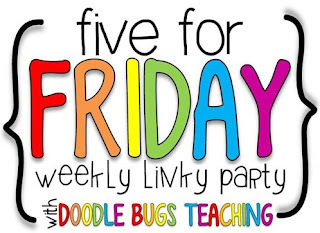 Since it's Friday, linking up with Doodle Bugs Teaching for her Five for Friday linky party! I thought the pool was closed when I came to work out... turns out the water was just ice cold and no one wanted to get in the pool. The lifeguards were just hanging out at the picnic tables. It was nice and sort of ominous having the entire public pool to myself. Getting ready for back to school... unpacking my lunch box and new Tervis water bottle. I'm obsessed with Tervis tumblers. I might have a small collection in my cabinet - but they are all different styles and sizes so I think it's justifiable ;) I think they're overpriced but they do perform as promised with NO SWEATING! I can't have my water sweating on my gorgeous new planner. I couldn't pass up this cute water bottle version with owls. Plus, I had a Bed, Bath, and Beyond coupon so I was able to get $5 dollars off! You can't pass up a good coupon like that! Spent the day on Tuesday with family at the Cincinnati Zoo. We had a lot of fun hanging out before everyone heads back to school. My favorite exhibit was the Galapagos Tortoise Encounter. You could pet the tortoises and watch them munch on leaves. It was really cool being so close to these guys! I remember going to the zoo when they had first hatched - they're getting MUCH bigger now! Speaking of animals, I found this super cute tape dispenser online and then there he was at Office Depot on sale for $5 dollars! Wooo! I think it was destiny. My boyfriend thinks I'm crazy. Oh well, I can't wait to get Rango out of the box! He changes color when you touch him. He's going to happily live on my teacher desk - no kiddos allowed to pet the chameleon. I might I might make a little catchy sign. Plus, my students have three brand new tape dispensers of their very own. Today, I went shopping for a first day of school outfit! I always like having at least one new outfit for the first day - it's something I even remember doing as a kid. But alas, I didn't see anything I liked...major bummer! So, I spent the rest of my day laminating and cutting out numbers for my library sticks. I might as well multitask while watching the Supernatural marathon! I just love zebra print! Can you tell? Hope everyone has a super duper weekend! The zebra is very nice! Where's the photo of your cute new outfit? Thanks for stopping by my blog and making me feel better about my failed tissue paper pom poms, Amanda! Love the Tervis tumbler! I think it's time for me to jump on that bandwagon. A water bottle that doesn't sweat? GOT to have it! I'm okay with your zebra passion. I bought some Zebra Washi tape. I'll share. I have to find a first day of school outfit soon too! I haven't found anything lately either though. But I love your owl tervis tumbler! I haven't seen that one yet!!! I always buy myself a new outfit for the first day of school. It is then the outfit that I wear for school photos that year - that way I will never double up!! Best of luck for you and wish you be happy forever. This is a interesting post and some points about new month are very precious in this and write my essay online post. We should read it and share this experience with others also. Dogs is sitting on the chair is a funny looking.